With all the gusto and “I’ve got this confidence” that only a pair of 23-year-olds can muster, my husband and I launched from our hometown in pursuit of a job offer over 3,500 miles away from family and friends. We left the comfort of the only town we’d ever lived in (a small town, I might add), and embraced big city living full of energy and savoring adventure. How do you even prepare for a move like this? We didn’t, we just jumped. Thankfully it worked. We found a house to rent in a quiet area and discovered the neighbors to be the stuff of movies. Minutes after signing our lease, they welcomed us to the block with an impromptu get together; they insisted we join them for even the most minor holidays; after 9/11 they congregated with us; when I was sick they brought groceries. I didn’t run errands alone for several weeks after moving in because one or the other of them always insisted we go together so I could learn the area “from an expert”. We all pulled together to support a family on the block after a tragic accident. We learned the art of front porch living from these friends. We were taken in and included, even when our shy natures would’ve had us hibernating and wallowing in homesickness. When I reflect on all the aspects of that major life transition, it’s those friends that stand out the most. It’s the times of community and sharing life that I remember (well, that and learning how to drive on the tollway. Yikes!). It was my first encounter with being on the receiving end of “Love thy neighbor” and it instilled a deep value for community and togetherness. It wasn’t complicated or elaborate, the things they did for us, it was the simple act of embracing us into their circle and making sure we were never alone. 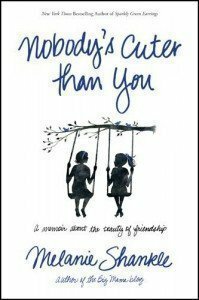 Melanie Shankle is a mom, a blogger, and a writer whose new book, Nobody’s Cuter than You , talks about this very type of friendship. The real friendship that requires effort; showing up; laughs loud, and cries hard. It forgives and loves and gives the benefit of the doubt. It makes a casserole, does a carpool pickup, and pitches in to get the last of the leaves raked before snow flies. Melanie writes with wit and wisdom, reminding us of the influence our friends have on who we were, who we are, and who we will become. Checkout the first chapter for free! Your turn! Tell us about your precious friends – leave a comment here or on Facebook . We do love hearing from you!